Rebel HQ’s Emma Vigeland reports from the #DropFox protests outside of Fox News‘ headquarters, where demonstrators demanded that companies pull their advertisements from Tucker Carlson‘s program in the wake of his unearthed sexist, racist and xenophobic comments. Protestors also were angered by Jeanine Pirro‘s Islamophobic comments about Rep. Ilhan Omar. Samantha Bee delivers a comprehensive takedown of “white supremacist” Tucker Carlson. These are the types of Islamophobia Fox News is OK with. The California condor is the biggest flying bird in North America, a title that it has held since the Late Pleistocene Epoch. It’s just one example of an organism that we share the planet with today that seems lost in time, out of place in our world. Captured this footage by happenstance while shooting some scenics in Northern Ontario. Was excited by the moose sighting, as I was leaving something unexpected took place. Shot in 4K with Phantom 4 Pro. Summary: Research in western Wyoming shows that close proximity of wolves does cause moose to move, but not enough to drive them from their preferred habitats — especially late in the winter. Driven by the need for food, moose in western Wyoming are less likely to change their behavior to avoid wolves as winter progresses, according to new research by University of Wyoming scientists. The findings, published today (March 13) in the journal Ecology, provide new insights into the interactions of the region’s apex predators and their prey. The results also highlight the complexity of the relationships between wolves and big-game species, making it difficult to reach general conclusions about whether and how fear of wolves has impacted the ecosystem, the researchers say. Oates is the lead author of the Ecology paper. Co-authors include his UW advisers: Jake Goheen, associate professor in UW’s Department of Zoology and Physiology, and Matt Kauffman, a U.S. Geological Survey researcher based at UW. UW’s Jerod Merkle, assistant professor in the Department of Zoology and Physiology, also was involved with the research, as were agency personnel from the National Park Service and U.S. Fish and Wildlife Service. The scientists tracked movements of dozens of GPS-collared moose and wolves in Grand Teton National Park and the Bridger-Teton National Forest over a five-year period, detecting 120 unique encounters among 25 individual moose and six wolf packs. An encounter was defined as when moose and wolves were within about 1,600 yards of each other. They found that movements of moose increased in early winter following encounters with wolves, but only when wolves were within about 550 yards. Even then, the moose didn’t move from their preferred habitat, which is near streams and marshy areas. Late in the winter, when the moose were presumed to be hungrier, there was no change in the movement rates of the animals in response to wolves in the vicinity. “The unwillingness of moose to abandon preferred habitats following encounters with wolves adds further support for the starvation-predation hypothesis,” the researchers wrote. In contrast, previous research has shown that elk — the primary prey of wolves in the region — will move when wolves approach within about 1,000 yards, even during winter. Elk also move from their preferred habitat to avoid wolves. The difference may be explained simply by the fact that moose are larger than elk and are more likely to stand their ground when approached by wolves, the researchers say. Additionally, the nature of moose’s preferred habitat — described as “structurally complex” — means it could serve as both a good food source and a refuge from wolves. Still, it would be inaccurate to say that the presence of wolves doesn’t affect moose movements. “Although moose may be generally less responsive to predation risk from wolves, our detection of a heightened behavioral response during early winter suggests that anti-predator behavior is dynamic within and among species of ungulates,” the researchers concluded. The courageous whistleblower Chelsea Manning was sentenced to jail by the US government on Friday after she refused to testify before a secret grand jury against WikiLeaks publisher Julian Assange. WikiLeaks published Manning’s “Collateral Murder” cockpit video in 2010 along with other leaked documents that exposed to the war crimes committed by the US military. 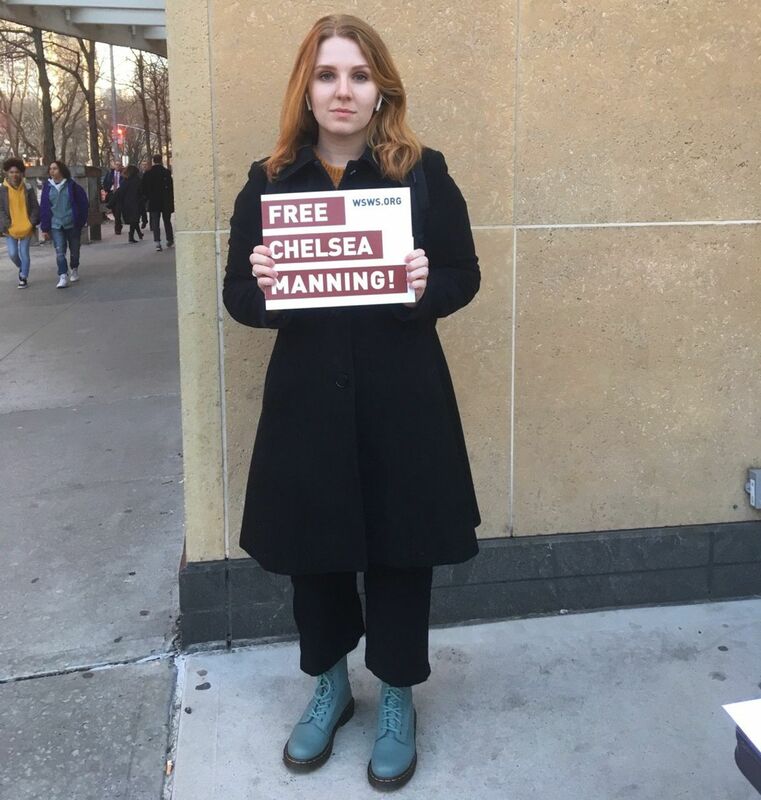 The International Youth and Students for Socialist Equality (IYSSE) and Socialist Equality Party are leading the fight to organize opposition to the attack on Manning and Assange by holding a series of meetings and rallies across the US. 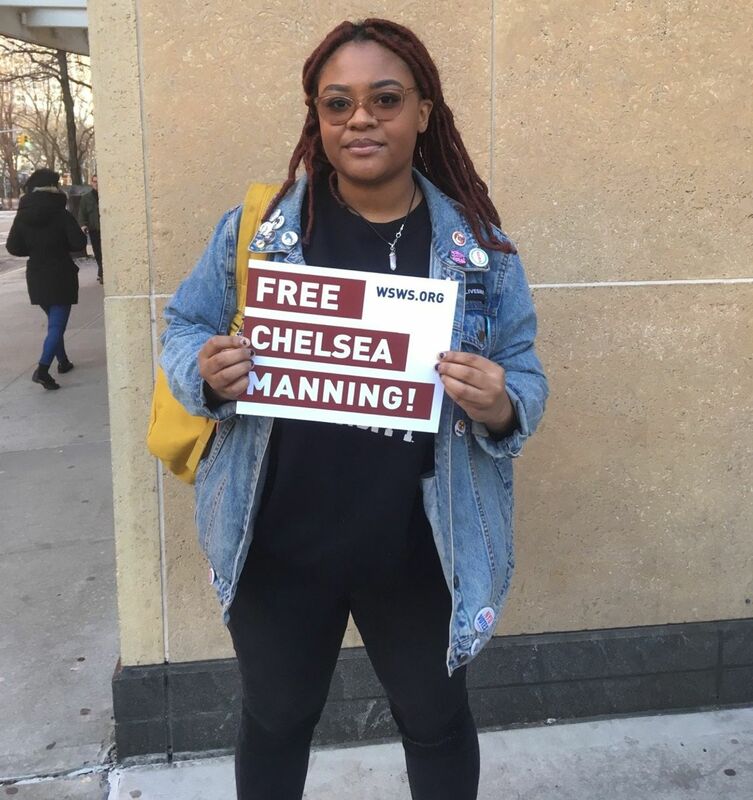 The IYSSE campaigned for the rallies at college campuses throughout the US, where students and youth voiced powerful support for the freedom of Manning and the defense of democratic rights. 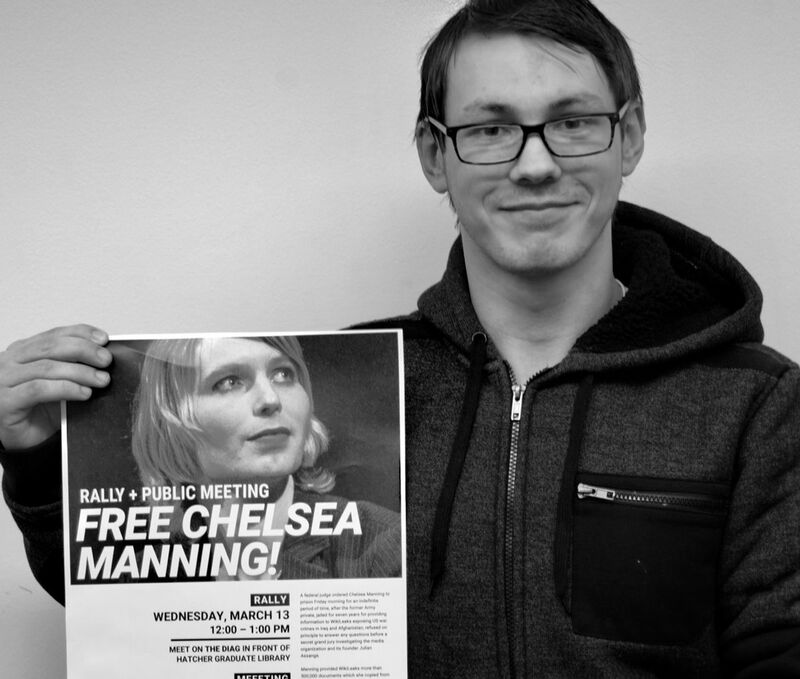 Jonathon, a student at Eastern Michigan University, said, “Chelsea Manning is one of many who want to bring to light the role of American imperialism in the massacres of civilians that are going on abroad that the United States is willingly committing. It is horrifying because of how it is ingrained into American society that America is the one which holds up democratic rights, America is the one which protects individuals, America is the one which is going around the world trying to keep people safe, and yet America is the one which is killing them. Luke, a high school student in Midland, Michigan, said that the American ruling class “has knowingly issued a provocation to the world over, threatening the freedom of the press and democracy itself with the jailing of one of its strongest voices. 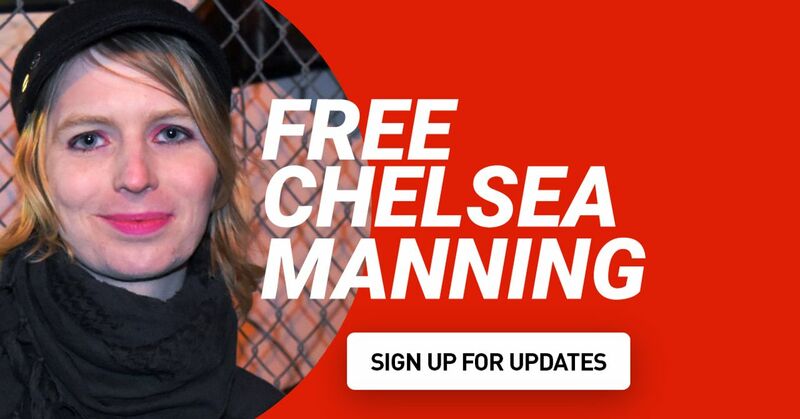 Chelsea Manning, like the man she has valiantly put her freedom on the line for, has once more become a class prisoner of the sadistic political superstructure that couldn’t get its fix with just seven torture-riddled years of imprisonment. 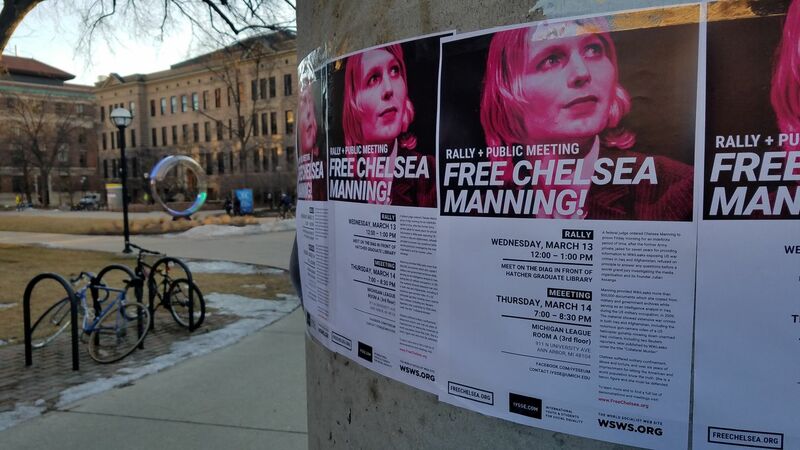 IYSSE holds rally at University of Michigan to defend Chelsea Manning: here. 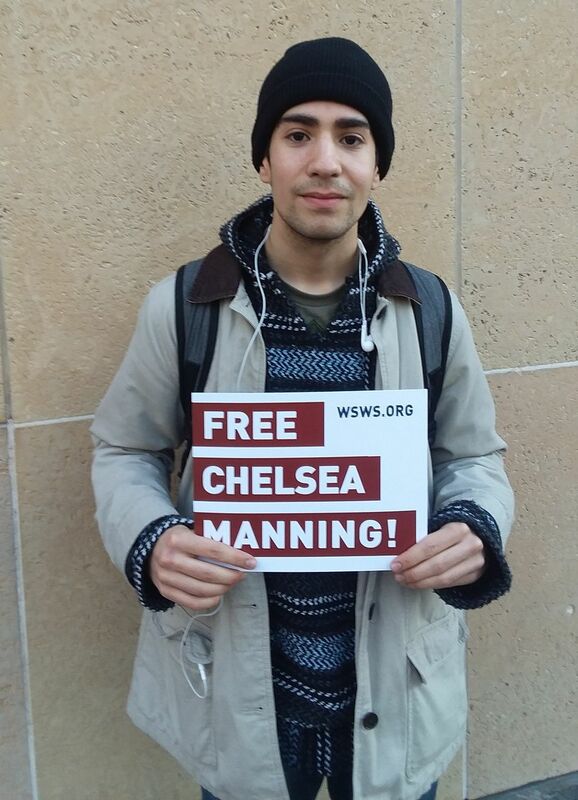 Voices at the London Solidarity Vigil in defence of Julian Assange and Chelsea Manning: here. Unsealed documents shed light on state conspiracy against Chelsea Manning: here. In April, 2018, I — Christopher Sayers — and a team of three other Cornell students — Facundo Fernandez-Duque, Rachael Mady, and Sarah Toner — traveled to the Mpala Research Centre in central Kenya on an Ivy Expedition. Our mission was to collect photographs, videos, and audio recordings of species underrepresented in the Cornell Lab’s Macaulay Library. During the 10-day expedition, we interviewed Shailee Shah ‘14 — an alumna of Cornell who is conducting her Ph.D. research at Mpala on the breeding ecology of Superb Starlings. Our team filmed Shailee throughout several days of data collection in the field with the ultimate goal of creating a short film about her work. One of the most challenging parts of the filming process was actually getting high quality footage of Superb Starlings — the focal species of the film! Whenever we would finish setting up the camera and tripod to start recording, the flock of starlings would immediately fly out of frame. It was almost as if they knew we were trying to film them! After returning to the US, producers in the Cornell Lab’s Multimedia department were gracious enough to mentor me as I worked to bring this piece to life. I practiced using robust video editing software and bolstered my skill set in multimedia productions; I hope to keep improving these skills as I move forward in life. As an emerging scientist myself, I hope to show my audience about the wonders of pursuing field research, and aim to inspire young scientists to follow in Shailee’s footsteps. FRANCE is experiencing an ‘epidemic of serious eye injuries’ as police repeatedly fire golf-ball-sized rubber bullets at Yellow Vest protesters, the country’s top ophthalmologists have written in a letter to French President Emmanuel Macron, demanding he halts use of the projectiles. The French newspaper Journal du Dimanche published the letter to Macron, written by the country’s 35 leading ophthalmologists, on Saturday. Many people risk losing their vision, the doctors wrote, adding that the rubber balls fly with great force and are often directed inaccurately. The letter demands ‘a moratorium’ on using rubber bullets. French riot police have become notorious for using hand-held guns, locally known as defence-ball launchers or Flash-Balls, during the protests that have been ongoing since November. Rubber bullets have been deployed more than 13,000 times, according to local officials. More than 20 protesters have lost eyes, five hands have been partially or entirely torn off, and one person lost their hearing as a result of a TNT-stuffed GLI F4 stun grenade. The legal status of rubber-ball guns has been repeatedly questioned by human rights associations and politicians in France and abroad. In early February France’s top administrative court refused to ban the police from using the hand-held launchers. Last Wednesday, UN High Commissioner for Human Rights Michelle Bachelet called for a ‘full investigation’ of excessive use of force towards the Yellow Vests who, according to her words, simply demand a ‘respectful dialogue’. Government figures show that over 2,000 protesters have been injured since the protests began in November. A French court rejected a bid by campaigners to have the use of such weapons banned, despite the UN’s call for an investigation into the excessive use of force by police. However, the mayor of one French town has instructed police to stop using the ball launchers. Dany Koxher, mayor of Phalsbourg, a town of only 5,000 people in the northeast Moselle region, said: ‘As a citizen and an observer, I find that the government’s responses are disproportionate against the demonstrators.’ In support of his position, he cited both the statement from the UN rights body and an earlier call from the Council of Europe to suspend the use of the weapons. Meanwhile, according to the Interior Ministry, 39,300 Yellow Vest protesters demonstrated nationwide last Saturday, including 4,000 in Paris, for a 17th straight weekend. Pink-vested women led the Paris march, calling for equal rights and equal pay a day after International Women’s Day. A water cannon was fired at several hundreds of the protesters who remained on the Champs-Elysees and wanted to leave the security perimeter. The march, which began at the Arc de Triomphe, at the top of the famous avenue, looped through both sides of the Seine River before ending at the top of Luxembourg Gardens on the Left Bank. In Paris, rather than the usual Saturday demonstrations, there was a sit-in at the Champ de Mars, near the Eiffel Tower throughout the weekend. Marches were also held in numerous cities around France, including Bordeaux, which has a strong contingent of Yellow Vest protesters, Lille, and Le Puy-en-Velay, in south-central France, where hundreds joined from other regions. ‘The people don’t want more of this financial globalisation’, said Paris protester Yannick Caroff. ‘The French people will not back down … Between 10 and 15 million French are in misery,’ he said. A Yellow Jacket ‘flash mob’ event occurred at Paris’s Charles de Gaulle airport against plans to privatise Aeroports de Paris, the body that manages the capital’s airports. About a thousand ‘Pink Vests’ – nursery school assistants and care workers – turned out in demonstrations across France calling for better tax and benefit conditions for their work. Saturday’s Yellow Vest demonstrations in several French cities also saw clashes between police and protesters. A larger showing is widely expected at next week’s protests, marking four months of marches and coinciding with the end of President Macron’s two months of ‘grand national debate’. Instead of the usual scattered rallies across France, they want demonstrators to converge on Paris and are planning a major protest for this weekend of March 16th, under the title of ‘Act 18. The Ultimatum’. • As French customs officers staged the sixth day of a work-to-rule strike last Saturday, airport officers joined customs workers in charge of Eurostar trains and of the Channel port of Calais. Eurostar trains from Paris to London were running up to two hours late, trucks were stacked up on the approaches to the Channel port of Calais and long lines were reported in airports across France on Saturday. As the Brexit deadline of March 29 approaches, French customs officers are demanding higher pay and better working conditions with actions all over France. Saturday was the first day that customs officers at airports across France joined in the work-to-rule strike. They carried out longer and more rigorous checks than usual, in a bid to demonstrate what might happen in case of a ‘no-deal’ scenario, and if full border controls are put in place. All unions representing customs officers working at Paris’s Charles de Gaulle Airport called for strikes until April 1st, warning disruptions could be particularly intense over the weekend. Paris’s Orly, Chambéry, Grenoble and Nice Airports were also reported to be affected. At Paris’s Gare du Nord railway station, where Eurostar trains leave for London, passengers waited in long queues to board trains. ‘All Eurostar trains are experiencing delays of up to two hours from Paris Gare du Nord and Lille Europe due to industrial action by French customs until March 12,’ Eurostar tweeted on Saturday. Some trains were cancelled. ‘People had to stand in line for half an hour in between two body checks, and only one screening machine out of five is in use,’ said FRANCE 24’s Louise Nordstrom, who was travelling from Gare du Nord. 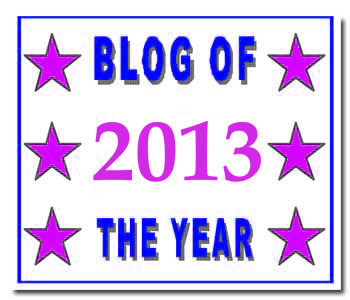 ‘But people are rather calm, even though many are going to miss their trains,’ she added. ‘This movement is going to last,’ Anne Azoulay-Fravel, a customs official from the CGT union, told FRANCE 24. I cannot foresee what will happen over the next few days, but it has been a long time since I last saw so many colleagues involved,’ she added. Azoulay-Fravel believes that Brexit has simply exacerbated a pre-existing discontent. ‘For years, we adapted to the government’s every reform, always doing more with less staff,’ she said. The French government has announced the recruitment of an extra 700 customs officials, over a period of three years, to cope with the demands of Brexit. However, unions say more are needed. Work-to-rule strikes, which began Monday in the Channel ports of Dunkirk and Calais, northern France, led to long delays for trucks waiting to cross to Britain. ‘Strikes are also taking place in Marseille, as well as in Nice’s airports,’ in the south of France, Azoulay-Fravel added. Last Thursday, some 500 heavy goods vehicles had been corralled in holding areas just short of Calais to avoid clogging road traffic but they were allowed to proceed later that evening. Trucks were nevertheless still backed up for about four kilometres (2.4 miles) on the A16 motorway lane leading from Dunkirk to Calais, authorities added. France: Police Threaten To Join Yellow Vests Protesters: here. After Wednesday’s meeting of the council of ministers, French government spokesman Benjamin Griveaux announced that President Emmanuel Macron would activate army units during this weekend’s “yellow vest” protests. This is the first time since the 1954–1962 war in Algeria that the army is to be mobilized in police operations on French soil against the population: here.